Solid colors can provide contrast to your slides, but you have to make sure that any text or graphics that appear on your slides can still be seen. For example, if you choose a dark red background, any text or graphics on your slides should appear in light colors. To make sure that solid background colors don’t obscure your text and graphics, you can also adjust the background transparency to make the color appear darker or lighter. If you click a slide in the thumbnail view and hold down the Ctrl key, you can select which slides you’ll change. If you don’t select any slide, PowerPoint will change all your slides. In the Customize group, click the Format Background icon. The Format Background pane appears. Use the Format Background pane to change the background of a presentation. Select the Solid Fill radio button. A pull-down menu appears, listing a palette of colors. 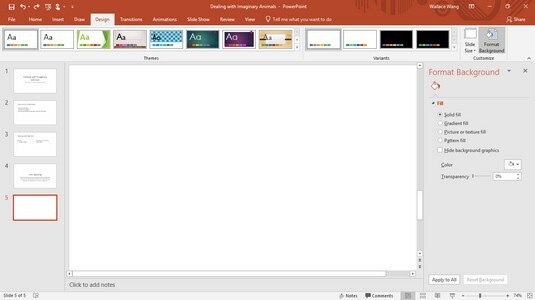 PowerPoint fills your slide background with your chosen color. (Optional) To change the transparency of the color, drag the Transparency slider left (0%) or right (100%). The higher the transparency value, the lighter the background color appears. (Optional) To change the background of every slide in your presentation, click Apply to All. If you don’t click the Apply to All button, PowerPoint changes only the background of the currently selected slide. If you click the Reset Background button, you can remove any background changes you made. In the Format Background pane, click the Close (X) icon. A gradient displays one color that gradually fades into another color, such as green to orange. To define a gradient, you define one or more stops, the transparency, and the gradient direction. Stops define where the colors in the gradient start and end. Transparency defines how opaque a color appears. The gradient direction defines how the gradient appears, such as vertically or diagonally. Select the Gradient Fill radio button. The Format Background pane displays additional options for defining a gradient. If you click the Preset Gradients icon, you can choose from a variety of predefined gradients. Click in the Type list box and choose an option, such as Linear or Rectangular. Click in the Direction list box and choose a direction for the gradient. In the Angle box, click the up or down arrow to increase the angle or decrease the angle, respectively. Drag the Gradient Stops sliders left or right. The far-left and far-right positions of the stop-position slider define where the gradient begins and ends on the slide. Click the Color icon, and then click a color in the palette that appears. 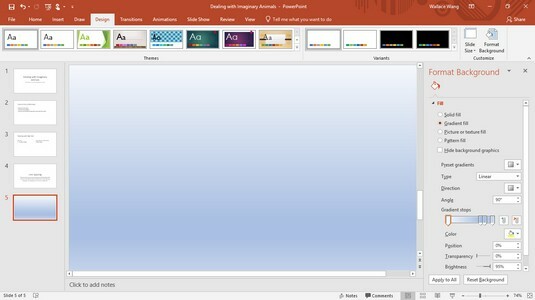 PowerPoint displays your chosen color as a gradient on the current slide. In the Position text box, click the up or down arrow to change the position of the gradients. Drag the Transparency slider left or right. The far-left position (0%) displays your chosen color in full strength, and the far-right position (100%) displays your chosen color to the point where it disappears from view completely (100% transparency). (Optional) To apply your gradient to every slide in your presentation, click Apply to All. If you don’t click the Apply to All button, PowerPoint displays only the background of the currently selected slide. A picture, such as clip art or a photograph captured with a digital camera, can appear in your background. After you use a picture for the background, you can adjust its transparency so that you can read any title or subtitle text on each slide. Select the Picture or Texture Fill radio button. The Format Background pane displays options for adding a picture to your background. File: Retrieves a graphic image stored on your computer, such as a digital photo. When the Insert Picture dialog box appears, click the picture you want to use and then click Open. Clipboard: Pastes a previously cut or copied graphic image from another program, such as Photoshop. Online: Displays a library of clip-art images you can choose. Type a description of the picture you want. When clip-art images appear, click the one you want to use, and then click Insert. Drag the Transparency slider to the left or right until you’re happy with the way the picture appears. To change the position of your picture, click the up or down arrow of the Offset left, right, top, or bottom text box. To apply your picture to every slide in your presentation, click Apply to All if you want. A pattern background can display lines, dots, or other types of repeatable patterns in the background of your slides. Patterns just give you one more way to enhance the visual appearance of a slide. Select the Pattern Fill radio button. The Format Background pane displays options for adding a pattern to your background. Click one of the available patterns. A color palette appears. The color you choose determines the color of the pattern of lines or dots you chose in Step 4. A color palette appears. The color you choose determines the color of the pattern background you chose in Step 4.